My sermon from 4th Sunday of Easter (May 7, 2017) on Acts 2:42-47. Listen to the recording at the bottom of the page or read my manuscript below. Yesterday was my third Trash and Treasure sale. Usually, on the day after the sale, I talk about something I found among the piles of donated, and dusty, boxes. Last year I talked about a record I found. Two years ago, I showed a collection of vintage Star Wars action figures. And today, I’m going to keep that streak alive but I don’t any props up here to show you. Instead, the items I’m thinking about are outside, sitting in our dumpsters. And they’re there because, well, I threw them there. When the sale was over, organizations from all over Northern New Jersey came to take what they could use. But when they were done, there was still stuff left and it needed to go somewhere. We grabbed everything that was left and carried it outside. Anything made of metal was set aside for Joe, a metal scraper, to pick up. Everything else was tossed into the dumpster. In went glasses, vases, toys, linens, kitchenware, lamps – everything that didn’t sell. And it was during that mad dash to clean up everything when some of us recognized stuff on the tables. There was that toy we pulled out from a dusty box that was covered in 30 years of dirt. We cleaned it, made it shine, and…no one bought it. There was that lamp our crew of engineers spent 45 minutes to get working – and it was still there, sitting on the table. We also noticed things we personally donated; items that had made us happy but are now going into the dumpster. One of the joys of Trash and Treasure is seeing all the stuff that is bought and doesn’t end up in landfill. But one of the small sadnesses is seeing what gets left. 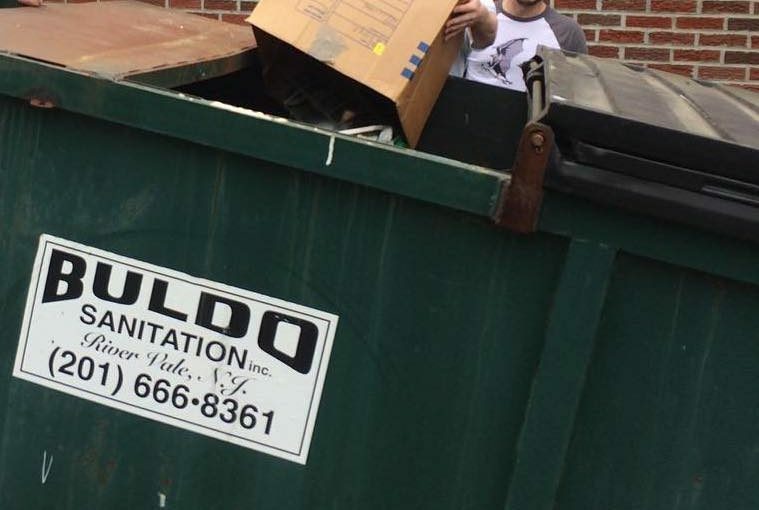 In that dumpster are the hours of work spent cleaning, sorting, and making sure everything was in its best possible shape so that it could end up in someone’s home. We’re left with a tiny bit of sadness, a smidgen of grief, when the things we spent so much time and energy on – do not turn out the way we hope. Today’s story from the book of Acts is a fun one. Whenever I’m in a bible study and theses verse comes up, everyone focuses on verses 44-45. “All who believed were together and had all things in common; they would sell their possessions and goods and distribute the proceeds to all, as any had need.” These verses at the end of Acts chapter 2 are describing Acts vision of what the early Christian community looked like. After the event of Pentecost, when the Holy Spirit empowered the disciples to make Jesus’ story known to people who did not speak their language, the Christian community changed. After a very brief sermon by Peter, something amazing happened and the number of people in the Christian community grew from a just handful of apostles to a community numbering over 3000. This new community is living in Jerusalem and is filled with Jewish people doing very Jewish things. They worship everyday in the Temple. They break bread and eat their meals together. They devote themselves to the teaching of their leaders and they regularly say their prayers. In the book of Acts, we don’t hear about non-Jews being part of the early Christian community until later. At this point in the story, the Christian community is very Jewish and is very devoted to Jesus Christ. And it’s that devotion that compels the community to live in a different way. Now, we can tell that the make up of this community is diverse because some of those 3000 have stuff and others have needs. The community probably met regularly and worshipped in large dining rooms of people who owned their own homes. Gathered in that space would be the rich, the middle class, the working class, and even slaves. The community would spend so much time together, they would begin to know each other in an authentic and real way. They would know each other’s names and each other’s needs. Inspired by their shared experience as being part of Jesus’ family, everyone would take what they have and sell it. Their possessions, their treasures, and maybe even their trash was gathered together so that anyone could use it. Every resource available to them is used to help individuals in the community, thrive. The great economic dividing lines between those who have and those who don’t – doesn’t limit who is included in Jesus’ family. Instead, the community uses everyone’s wealth to make sure everyone is healthy and secure. Their pre-existing conditions of being part of a society where the rich stay rich and the poor stay poor isn’t what the early church, according to Acts, looked like. Now, we might give this way of life, a name. We might call it communism or socialism or some kind of -ism that might scare us because we live in the United States. Capitalism is part of our way of life. Our possessions are our possessions and we don’t want to give up control over what we own. But Acts isn’t about any -ism. Acts is about what it means to be and to do, church. At the start of chapter 2, the Holy Spirit showed up in a big way. Jesus’ story was heard and experienced in diverse languages that the apostles didn’t know. This diversity of languages created a community where the diversity of class and wealth showed up too. The church isn’t supposed to be for only one kind of person with one kind of experience, or language, or economic background. The church is for everyone because the Holy Spirit brings all kinds of people together. And once the Holy Spirit connects us with people who are not like us, we are not called to ignore their needs. We’re not here to maintain the divisions of our wider culture, acting as if economic class is somehow ordained by God or a sign of who God loves. We’re instead called to live a different kind of life where people are known and where needs are not hidden or pushed aside. We’re called to actually form a true and honest and authentic relationship with the people around us. Now this connection isn’t always easy to maintain or sustain. There are times when we will feel like this connection, this relationship with our community, is something we’ve invested time, energy, and resources into but…it doesn’t seem to be going in the direction we thought it would. No matter how much we clean, or work, or how many hours we spend to make this community more faithful, the future we thought was going to come about might, instead, be placed in a dumpster outback. But even when our ideas fail to materialize, even when a harsh word or a stress-filled moment makes us wonder just what this community of faith is all about, we keep being the church – rooted in Jesus. We keep being with each other even when we don’t want to be. We stay connected through a shared meal at the communion rail and we pray for each other, no matter what. This community isn’t just a random group of people who show up on Sunday for one hour each week. We’re part of the body of Christ. We are empowered by the Holy Spirit. We are a community called to not let divisions be what define us but, instead, to be a community where care, and love, and hope are at the center of everything we do. The community of faith is a community where the Holy Spirit shows up. And when the Holy Spirit shows up, our way of living 0 our way of being – changes. Next Next post: Jesus is a gate.